My biggest SD Card storage for my camera is 64GB. As of now I feel it is enough to carry photos and videos for one day travel shoot. Although I still often bring one 32GB SD card for contingency. 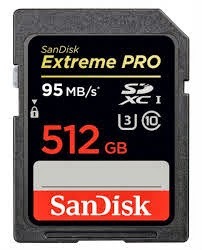 Sandisk, one of the biggest name in SD card, has just announced the Extreme Pro SDXC card (UHS-1) which is the first 512GB SD card. Its storage capacity is twice bigger compare to my Macbook pro 256GB. This first in the world SD card is designed for 4K video capture and high-speed burst photography. The only drawback I see is the tag price of $800.